Hi, just installed Sticky Password 8.1.0.108 and trying to use it with Opera 52.0.2871.40 stable. Sticky Password will not install with this version of Opera! Is there any solution to this problem please? @john164 They say that Opera is supported? Install the Install Chrome Extensions extension and then goto https://chrome.google.com/webstore/detail/sticky-password-autofill/kaafoaobjaplofpihlhbcbcjhmgnjplf and install. The link for the sticky password extension was gotten from https://www.stickypassword.com/extension-installation-windows-chrome?lng=en-US after clicking "install" in Chrome and then clicking the "open in web store" icon in the dialog that pops up. So, that one in the Chrome web store is the correct one. The install link was gotten from [this page(https://www.stickypassword.com/help/installing-the-sticky-password-extension-for-chrome-on-windows-1094) in one of the pics. You'll have to test to see if the extension works fine in Opera, but there's a good chance that it does. Note that if you're using the extension to save your passwords and don't want Opera to also save them, in Opera, goto "Menu -> settings -> Private and Security -> Passwords" and uncheck "Offer to save passwords". Thank's for replying and providing the Sticky Password links, The extension installs but will not work! clicking on the icon top right of opera it tells me the sticky password is not instaled or running when it is. 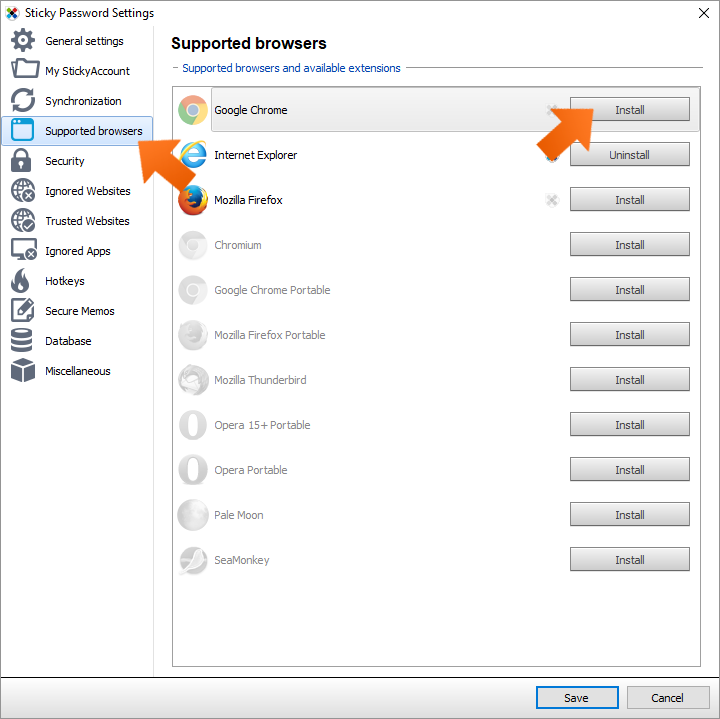 Go to opera extensions and Sticky Password extension is installed. @john164 I wonder if there's another step to get it working. Go to the spot in this pic. Is the install option for Opera is grayed out like in the pic? It might be worth it to ask them what Opera needs to do to make the extension work. I see from the manifest file for the extension that it uses native messaging to communicate with the Sticky Password app. Maybe that doesn't work in Opera. Delete the extension from Opera and then try this. Download the Opera installer, launch it, click "options", set "install path" to "C:\Users\yourusername\My Program Files\Opera Sticky", set "install for" to "standalone installation" and install. Then, close your regular Opera if it's open. Then, in the Sticky Password app, goto "Menu -> Settings -> Supported Browsers" and click "Install" for Opera Portable 15+. It should then detect your portable Opera because it's running. Sticky Password will then ask you to close all Opera's windows. When you do, it'll install the extension in that Opera. Then, in Windows Explorer, goto "C:\yourusername\My Program Files\Opera Sticky\profile\data\extensions", right-click on the folder for the extension (it'll be a long id), choose "cut", go to "C:\yourusername\My Program Files" and paste. That will move the extension folder out of that Opera install so Sticky Password doesn't mess with it (it was deleting it on me from that location when doing the below). Then, you can delete the "C:\yourusername\My Program files\Opera Sticky" folder. Now, in your normal Opera, goto opera://extensions, click "Developer Mode" and click "Load unpacked extension". Point it to "C:\Users\yourusername\My Program Files\IdForTheExtension\VersionFolderForTheExtension". Then, when Opera loads it, choose "allow" if it asks. Doing that works for me and the extension seems to function. Didn't test thorougly though. If it does work for you, you'll have to see if "update extension" works fine when there's a new version. If not, you might have to repeat the step above to update. Remember to disable Opera's saving of passwords in its settings if you want. If everything does work fine, it'll be time to report the issues to Sticky Password and try and get them to sort things out. @john164 Awesome! Do you have a link to the forum post for others that read this thread? Here is the link to download a working version of Sticky Password for Opera.